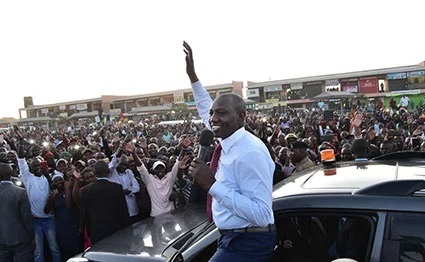 Friday April 12, 2019 - Deputy President William Ruto is planning some drastic action should President Uhuru Kenyatta continue embarrassing him. Since the time of the handshake with NASA leader, Raila Odinga, Uhuru has been humiliating his deputy like a child and according to some sources within the National Intelligence Service (NIS) even Uhuru Kenyatta’s backyard is angry with him for showing signs of betrayal. According to former Jubilee Party Vice chairman, David Murathe, Ruto is planning to ditch the Jubilee Party should Uhuru continue embarrassing him. A few days earlier, Ruto was received by a huge crowd donning yellow T-shirts, rekindling memories of his defunct United Republic Party (URP). The youths wore T-shirts bearing a huge image of the DP as they welcomed him to Banana, Kiambu County. According to Murathe, Ruto is planning to ditch the ruling coalition and go it alone in 2022. “Are they hinting at leaving Jubilee?” Murathe asked KTN‘s Pointblank host, Tony Gachoka, on Wednesday. All Kikuyu are behind DP we owe you and we will pay back sir.